Garth Brooks‘ 10-disc Target box set, The Ultimate Collection, was noticeably absent from MusicRow‘s Weekly Register sales report, despite news outlets reporting sales of 134,000 units—enough to unofficially land the package at No. 2 overall this week (Nov. 11-17). The reason: Target’s $29.99 offering was too low for the box set to appear on the SoundScan chart. Individual discs in a box set must be priced at at least $3.49 each, meaning his set would need to retail for $34.90 to be included. If the discs had sold for the qualifying price, an artist/retailer can still choose whether to report numbers of exclusive releases. According to those internal numbers reported by Brooks’ own Pearl Records, the box set landed just a few hundred units shy of the total consumption of the No. 1 album, Tribe Called Quest (135k). The hip-hop group released its first new music after a nearly two-decade hiatus, on the heels of the death of one of its rappers in March. A strict physical album sales comparison would show Brooks outselling the hip-hop group by well over 20,000 units. Brooks’ box set was not available for streaming. 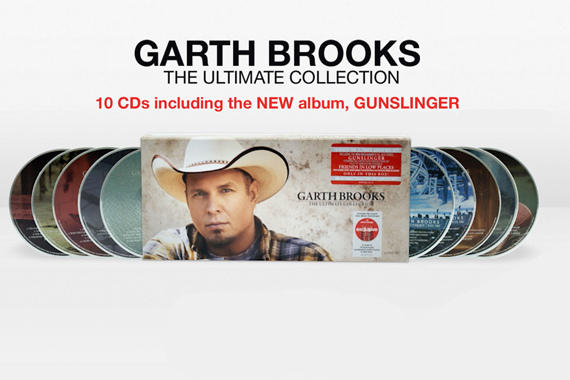 Interestingly, Brooks’ forthcoming Gunslinger album was included as a disc in the Target exclusive. Gunslinger will officially be released to mass retailers as an independent album on Nov. 25 and will be streamed on Amazon. According to those numbers, Gunslinger has already sold 134,000 units ahead of its debut later this week, but those numbers may be null and void according to SoundScan. Not all was lost, Brooks did debut at No. 1 (country chart) and 11 (overall chart) this week with his wife, Trisha Yearwood, for their Christmas album Christmas Together (21,144 units). The project also appeared at No. 2 on the overall holiday album chart (behind Penatonix‘ October release). Like Billboard, MusicRow‘s Weekly Register figures are sourced courtesy of Nielsen Soundscan.